Just before training camp last season, Doc Rivers summoned Lou Williams into his office. 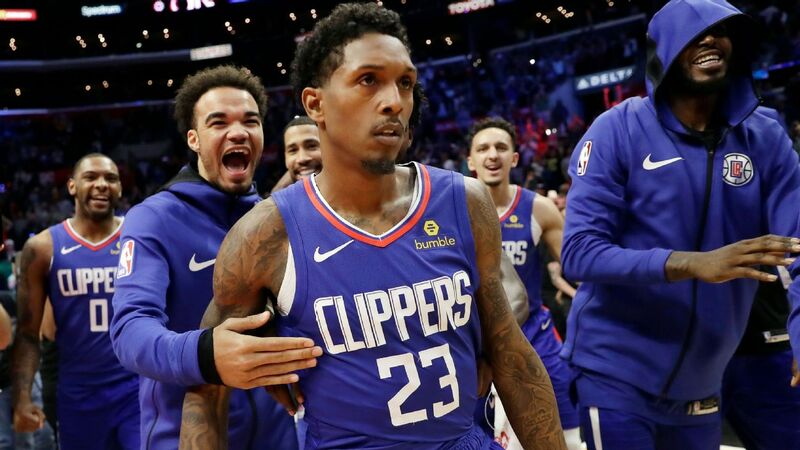 The LA Clippers had acquired Williams weeks before in the Chris Paul mega-trade, becoming Williams' fifth team in three calendar years. Williams was among the last Clippers to show up that summer at the team's practice facility, Rivers says. Rivers' assistant had trouble getting in touch with him on the phone. Williams was entering a contract year. Rivers needed to know if Williams was invested. "I wasn't buying in," Williams says. "I had bounced around. I was wary." Rivers told Williams he saw a potential match. "He was like, 'If you got a girlfriend, kids, whatever, get comfortable here,'" Williams says. "'We are gonna do something special.'" But Rivers needed something first. "'You've given all the things you don't want to do,'" Rivers remembers telling Williams half-sarcastically. "'I don't want to play defense.' Well, damn, Lou, I need you to buy into stuff." Rivers told Williams he had to at least be in the right places on defense. He needed Williams, who mostly refuses to lift weights, to give the team's medical staff a chance to build a personal program for him. Rivers urged Williams to come to him if he had issues with playcalling, the team's practice schedule, whatever. "Once we had that conversation," Williams says, "I bought in." Rivers had less intel on a young big man who came in the Paul trade. "When we first got Montrezl [Harrell], it was, 'Why didn't [Houston] play him?'" Rivers says. "'Like, what does he do?'" Harrell had been known to sulk and retreat within himself when he didn't play much, according to sources familiar with his time in Houston. His trash talk in practice could be biting. None of that is unusual for deep-bench guys who think they deserve more time. Spun another way, Harrell's moodiness was a manifestation of the fiery competitiveness that unnerves opposing big men today. What was unusual: In 2016, the league suspended Harrell five games after he shoved a D-League referee. The "hothead" label stuck. "Trez can be an emotional player," Rivers says. Two years after the Paul deal, Williams and Harrell form one of the league's most dangerous pick-and-roll partnerships and the backbone of the highest-scoring bench -- averaging more than 53 points -- in the past 20 years, per ESPN Stats & Information research. They have each made changes -- to routines, workout regimens, coping techniques -- without losing what makes them who they are. Earlier this month, Williams became the NBA's all-time leading bench scorer. He is second in fourth-quarter points, behind only James Harden, and a robust 19-of-34 in the last three minutes of games when the score is within three points, per NBA.com. Williams is favored to win his third Sixth Man of the Year award, which would tie Jamal Crawford for most all time. Harrell has a case for finishing second in voting; no teammates have ever gone 1-2. "The Rockets," Williams says, "paid a healthy price for Chris Paul." Williams and Harrell pair for about 39 pick-and-rolls per 100 possessions, ninth most among all rotation combos, per Second Spectrum data. The Clippers average 1.11 points when either Williams or Harrell shoots out of the pick-and-roll, or passes to a teammate who shoots right away -- one of the fattest marks among all duos. Include all possessions after Harrell screens for Williams, and the number leaps to 1.21 -- also one of the best. Each is good on his own: Williams the slippery scorer, Harrell the ferocious dive-and-dunk machine who treats the rim like a pull-up bar along his door frame. Together, they form something more. They lift each other. They keep adding subtle touches designed specifically to work in concert. Defenses have no idea what is coming. "They just match each other's speed," Rivers says. "They feel each other." Vibing with Williams is tricky. He starts and stops, leans one way and then swerves the other. He floats along the horizontal plane, waiting until his feet almost hit the ground before he decides to shoot or pass. "I don't make a decision till I see fit," Williams says. "That's why I'm so effective. My mind isn't predetermined." Harrell has mastered the steps. Williams loves to go left; when he has the ball on the right side, defenses try to pin him there. Harrell knows that, and plants himself in the center of the floor -- a looming threat for Williams to get where he wants to go. Williams' defender will spot Harrell lurking, and pivot to face the right sideline -- stationing himself between Williams and Harrell. That half-turn opens a runway for Williams on the right side. If help defenders aren't ready, Williams jets through that space -- away from Harrell. Harrell knows what to do then: cut like hell to the basket. "When Lou rejects [the pick], Trez knows to dive," Rivers says. Sometimes, Harrell never really screens for Williams; he just stands 10 or 15 feet from him -- enough to trigger that half-turn. "It's just a feel," Harrell says. They have worked to get there. Harrell visits Williams in Atlanta in the offseason, and played with Williams in a pro-am league there. "We've spent time to get that flow," Harrell says. Harrell knows to stay ready for a pass when Williams is drifting in midair, cocking the ball. "That part of our chemistry took a bit to get down," Williams says. At first, Harrell would turn to the basket and brace for a rebound, only to see the ball fly over him -- or bonk him in the head. "I've definitely thrown the ball out of bounds a few times," Williams says. It is a running joke on the team that Williams will pass only to Harrell. He has hit Harrell 680 times this season, more than double the amount of passes he has thrown to any other player, per NBA.com. (Danilo Gallinari, LA's best player, is next with 301.) A full 169 of Williams' 377 assists have gone to Harrell; Tobias Harris remains No. 2 -- recipient of 31 Williams dimes -- and he doesn't even play for the Clippers anymore. "That's not a secret on our team," Williams says. "It's not a problem. Once we establish our rhythm, it opens the floor for the other three guys." "We're just out there freestylin'," Williams says. Harrell has honed some Lou-specific injury-prevention techniques. Williams loves to "snake" the pick-and-roll -- coachspeak for dribbling around a pick, and crossing back the other direction. That can lead to collisions. "A few games ago, I ran smack into [Gallinari]," Williams says. "Damn near broke my ribs." "That's the great thing about Trez -- he'll adjust on the fly," Williams says, laughing. "And sometimes, he'll just f--- it up." Trap Williams, and Harrell is a capable release valve. He is comfortable catching far from the rim, making plays off the bounce, or spraying passes to open shooters. Harrell wants to be known as more than an energy guy. He's skilled, and smart. "I'm proud of what I added to my game," he says. Switching is a no-no. Harrell bullies smaller guys on the block, and has a soft touch on floaters and half-hooks. Williams revels in toying with big men on the opposite side of those switches. "If a team switches," Williams says, "that's our time to party." Durability also helps. The Clippers crafted that personal workout regimen for Williams, and he has been religious about it. About a dozen times a month, Williams comes in for stretching exercises, work with resistance bands, and drills with a medicine ball. They limit his weight work. They don't make him wear a heart-rate monitor. Off the floor, Williams still likes to have a good time. He famously had two girlfriends who knew about each other. Evan Turner credited Williams with getting him drunk (on shots of Patron) for the first time when they were teammates in Philadelphia. Some executives who thought over the years about acquiring Williams worried younger players might follow him but not be able to perform at their peak the next day. "Yeah, I'm sure that played a part [in changing teams]," Williams says. "But I never was a bad example." At 32, he picks his spots. "I always could do whatever I wanted," he says. "But I got older. Some things don't work how they used to. I didn't really cut anything out as much as I cut stuff back." He is aware of his influence on younger players. "Sometimes, the young guys are like, 'Why didn't you call me?' Because I usually have them go with me on the road, or when I go out to eat. But sometimes now, I go by myself, because y'all are probably not gonna be able to operate how I'm gonna operate. I don't want to put you in a position where you won't be at your best and I still can do it." On their visit to Miami, the Clippers organized a voluntary team dinner at Prime 112 in South Beach -- an NBA hot spot. About 40 people showed -- 80 percent of the traveling party. Williams reserved a private table upstairs. Team officials wondered who Williams planned to invite. They peeked in and found Williams talking ball with Shai Gilgeous-Alexander and Jerome Robinson. That has become a common sight -- Williams mentoring young players. "I try to be the best old head I can be," Williams says. Some within the team refer to Williams as the "Trez Whisperer." When Harrell's intensity teeters in a bad direction, Williams can settle him. "He knows I'm not saying something just to be an old guy saying something," Williams says. "I genuinely care about him, and how he is perceived." "Lou is the person I want to hear when I start getting in my own head," Harrell says. "He has helped me past the struggles and the problems I've had." Harrell made no secret of wanting to start last season, Rivers says. Rivers tried it four times this season but didn't like the trickle-down effect, he says. He won't start Williams. "I don't want Lou defending starting 2-guards," Rivers says. The same logic might apply to Harrell. He's undersized against starting centers, and a liability on the glass. He can outrun and outwork those guys, but he feasts on backups. Harrell is content now, Rivers says, having seen how he can impact the game off the bench with Williams as his running mate. Rivers has found Harrell a more willing listener. Against Minnesota last week, Harrell pushed the ball in transition instead of outletting to an open teammate. "I got on him immediately," Rivers says. He showed the play at the team's film session the next day. "Everyone knows, if you don't pass when you should, it's going on film," Rivers says. Harrell took the criticism in stride. "He buckles at first, but he always comes back," Rivers says. Harrell has taken to watching film on his own, pinging Rivers with suggestions, and even needling Rivers if he notices an adjustment the coach missed in real time. "It makes his day when he sees something I should have done," Rivers says. "I'll watch film and think, 'Oh, Trez is gonna get me tomorrow.'" For Rivers, that Harrell is watching is a healthy sign of engagement. Skeptics wonder how engaged Harrell would be if his playing time dipped, but that is moot; Harrell has played himself out of any such scenario. He and Williams have become the best versions of themselves in LA. That applies across the board. Somehow, a team of journeymen and impending free agents has come together and found a magic only a few teams discover each season. Everyone is happy -- playing hard, playing for one another. "We just got a good culture here, man," Williams says. 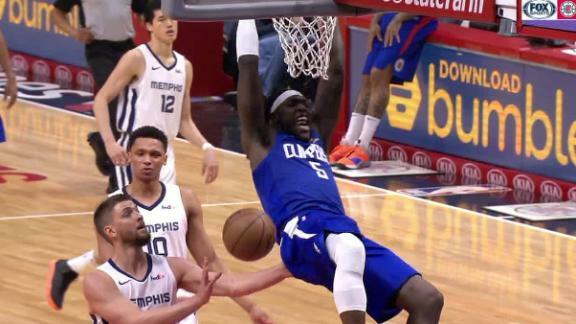 Danilo Gallinari, Montrezl Harrell and Lou Williams lead the way to a 113-96 win in LA. The Clippers' 13-2 record in March is an NBA best this season.